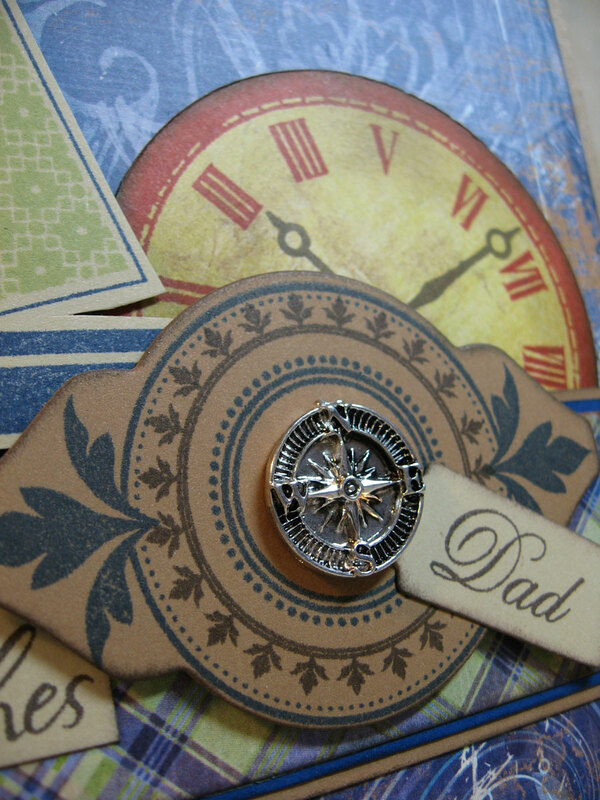 Just a quick post today to show a masculine card I made for my Dad's birthday this weekend. I'm always happy to make a more masculine style card because I rarely have an occasion for one. My dad enjoys fishing and boating, lives on the water and spends a lot of time at Port Canaveral (FL) where his biggest advertising account is: The Canaveral Port Authority. Good old Dad has owned and operated his own advertising agency since 1984 (Wolf Jessee Paquin Communications) and is still going strong. Really gotta admire him for that, especially through some tough economic times over the years. 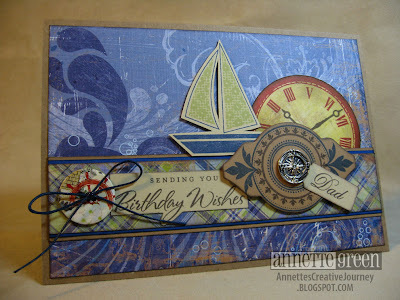 The papers I used for this card are from Fancy Pants Designs' Beach Bum collection. Perfect for this themed card. The die-cut is from PaperTreyInk (Mat Stack 2) and the stamping inside is from their Mat Stack 2 Collection and the leafy circle is from their Everyday Treats collection. The innermost circle, the birthday sentiment and the big clock are from Close To My Heart (Connections, Card Chatter - Birthday and Make it Count). 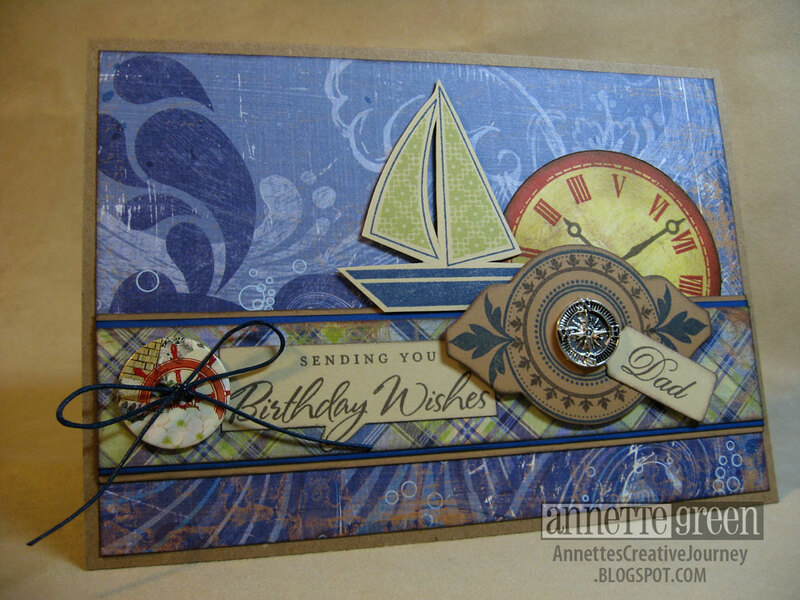 The sailboat and the word Dad are from PaperTrey's Men of Life set. The metal compass is actually a jewelry charm from which I snipped the top loop with my Tonic scissors. Finally, the chipboard button and twine came from Websters's Pages Yacht Club Buttons & Twine. A perfect match! Be sure to visit those links above. You will LOVE Fancy Pants and Webster's Pages products, as well as PapreTreyInks dies and coordinating stamp sets. They are all gorgeous! Thanks for stopping by today. Enjoy your Monday. Beautiful card, Annette! I'm sure your dad will love it. You are SO talented -- love following your creations on your blog! Oooo love that Beach Bum collection from FP. Of course another fabulous masculine card.